This map illustrates evolution of satellite detected waters over the central part of Khartoum City, Sudan, extracted from TerraSAR-X imagery (3 m) acquired on 11 August 2016 and SPOT-7 on 15 August 2016 (1.5 m). During this period, it has been observed that the water expansion is predominantly located in areas along Nile river banks. 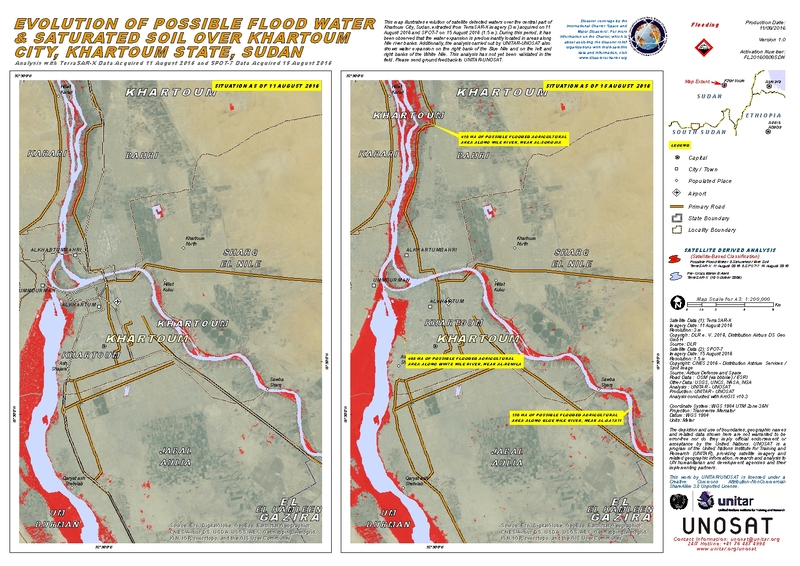 Additionally, the analysis carried out by UNITAR-UNOSAT also shows water expansion on the right bank of the Blue Nile and on the left and right banks of the White Nile. This analysis has not yet been validated in the field. Please send ground feedback to UNITAR-UNOSAT.